Football player John Kent (Randolph Scott) accompanies his friend Huck (Fred Astaire) and his band to an engagement in Paris. Before they even get around to start work they are fired over a misunderstanding and find themselves broke and stranded in Paris. The only person they know in this capital is John’s Aunt Minnie (Helen Westley) who under the name "Roberta" runs a famous fashion business, helped by her assistant Stephanie (Irene) - not only a talented designer but also a White Russian Princess. first encounter...and he is already trapped! 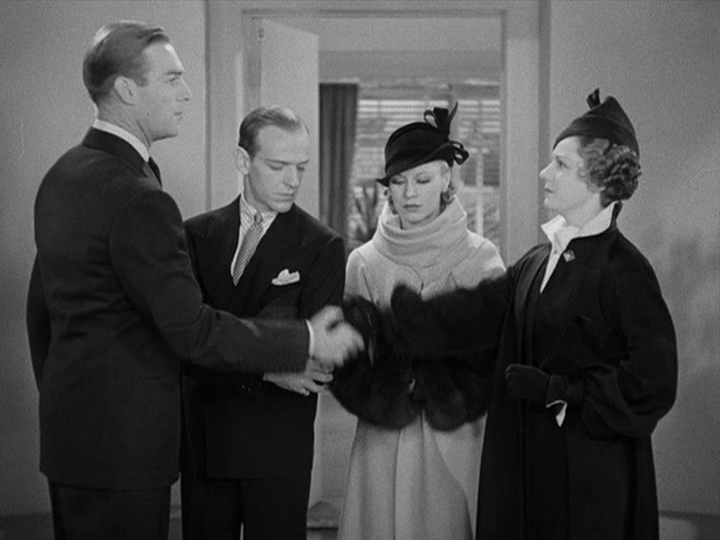 The visit at Aunt Minnie’s turns out very successfully not only under the aspect that John meets Stephanie but that Lizzie (Ginger Rogers) is around - an old sweetheart and dance partner of Huck. She is passing herself off as Polish countess Tanka Sharwanka and conveniently works at a Russian club as singer. Lizzie/ Tanka gets Huck and the band a job there, John gets a makeover by Stephanie and Aunt Minnie, and all could be very nice if Aunt Minnie wouldn´t die and leave the business to John and that old flame of his - Sophie (Claire Dodd) - wouldn’t show up…well, we know now in which direction the whole thing is heading, and that we are going to make some detours before we´ll reach our final destination - a Happy End! That’s a charmer of a film! Irene called the story “inane and silly” which is simply true, but she also called “Roberta” entertaining, and real high-class entertainment that is. 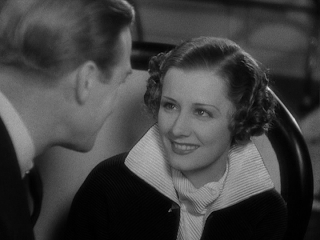 This film offers a wonderful Kern score, 30s Hollywood glamour at its best and last not least the talents of Irene Dunne, Fred Astaire and Ginger Rogers, by they way billed in that sequence. I remember watching “Roberta” very well the very first time because it put me in such good humor, and nowadays I find myself smiling in front of the TV screen, which certainly isn’t the worst reaction to a movie. Dinner? Gee, that would be swell! “Lovely To Look At” was especially written for Irene and was not in the original score of the play, which was quite a hit on Broadway. 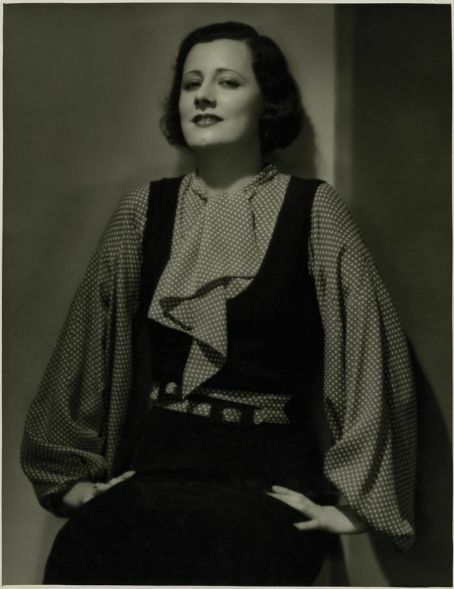 Irene made the number 20 of the popular billboards with this number in June ´35, but the song which is even more associated with Miss Dunne is “Smoke Gets In Your Eyes” which was frequently played when Irene was recognized somewhere. Another song added to the filming was “I Won’t Dance” to give Fred and Ginger - in their third pairing - a chance for a second dance number. 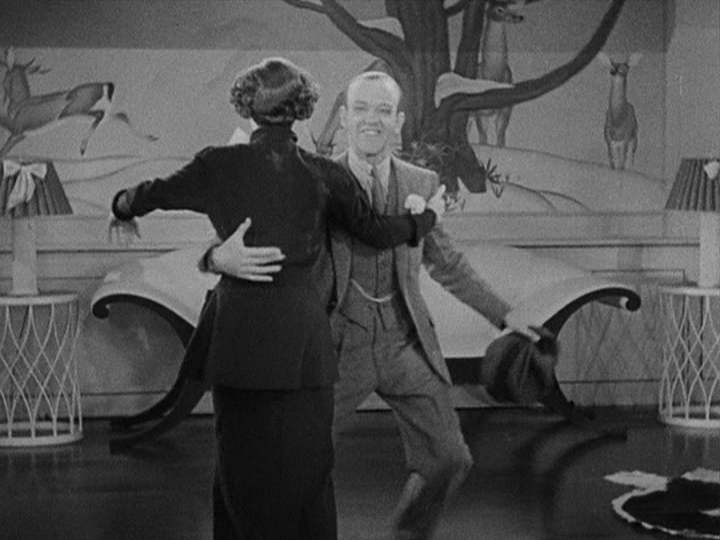 Anyway, those dance numbers: these great Astaire choreographies, which are perfectly staged and at the same time have an air of improvisation and effortlessness about them - a joy to watch. Lightness is the leitmotif of the whole movie, and as we know, easiness is one of the most difficult things to accomplish. "To show how your mind can play tricks, I got so nervous over the song because I knew I‘d have to be lovely to look at walking down the staircase singing the song. I got no sleep the night before, and when I went in the next morning, the cameraman told the director, "I‘m not going to shoot her today. That‘s all there is to it. She‘ll have to go home to sleep." We waited for a day or two, I rested up, and then we shot it." 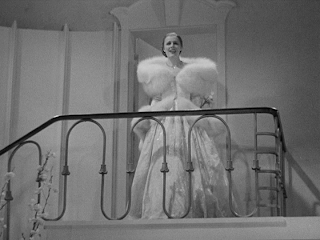 Well, after Miss Dunne had enough sleep she gave us this "singing knockout" descending the staircase - and it‘s kind of comforting that even divas have to rest up to look her best. The costumes in this film (designed by Bernard Newman) really deserve an extra mentioning - they are the epitome of 30s chic and luxury and devoured a nice chunk of the production costs. Allegedly, one of Irene‘s was so highly flammable that she was followed by a fireman over the lot and I‘m really glad that today Miss Dunne is not remembered because she blazed up on the set of „Roberta“! Moreover, don‘t miss a short glimpse at a very young, blonde Lucille Ball as one of the models in an elaborate fashion show. Looking for some relaxation? Just throw the DVD of „Roberta“ - a nice WB release - into the player and maybe you‘ll end up singing - those songs have a high "hunting melody" quality - and even trying some dance steps. Irene singing, Ginger and Fred swinging: don’t miss this! Highly recommended for Christmas shopping and wish lists! Irene performing "Smoke Gets In Your Eyes"
and here are her numbers from "Roberta"
the plot is silly but the movie is fantastic! Who cares about the plot when you have those actors, those songs, those dresses. It's one of my favorite musicals. Now we're talking! I've seen most of Roberta on youtube (not my favorite way to watch movies but that's how it goes)and it really feels like she's moving more toward "lightness", which is what I think of as one of her defining characteristics. "Smoke Gets In Your Eyes" is deservedly a classic (there's a great link to Irene singing it on youtube-- http://www.youtube.com/watch?v=gkQU-VQkhGw )Hope everything's going well for you, Susanne-the site is looking great! Sorry to get off topic, but I've recently sent an e-mail to the site. Did you get it? Hi and thanks, folks! Well, one more drama and then it´s "Theodora Goes Wild". 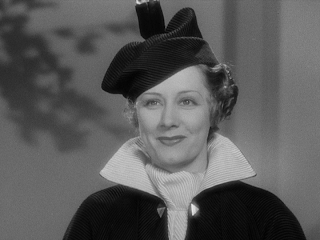 Of course Irene is best remembered for comedy - which has multiple reasons, and is IMO not about single Dunne performances. I personally don´t prefer Irene in comedy and looking at her career as a whole, she switched a lot between different genres. It´s quite interesting that Irene was being discussed for a couple of films Bette Davis did in the end: All This And Heaven Too, Now Voyager and Mr. Skeffington for instance. 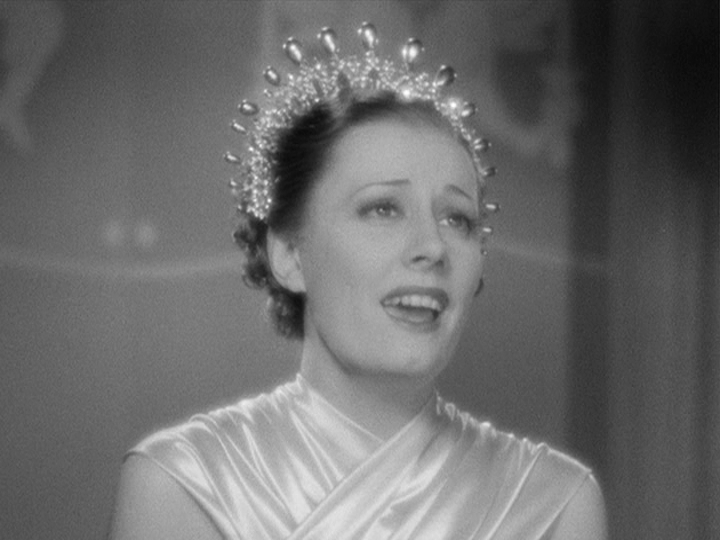 The one thing I regret regarding Irene´s career is that she never got around to playing a villainess, especially because she had definite ideas how she would have done this - with a lot of sweetness! Evil à la Dunne! Exactly Susanne! It's the only thing I regret too! I would have LOVED to see Irene playing an evil character even though it would be so hard for me to hate her haha but yes, it would have been amazing, totally different!! I wish she would have starred in a noir film too! Kinda Hitchcock film, at least once!!! It's the only thing I'll always regret! Thank you for another great review, Susanne. Roberta is a marvelous piece of entertainment. That's a great blog and I gladly started following it! Loved your review of "Roberta", I love this movie. I agree, it is a very fun movie and has some of my favorite Irene songs. 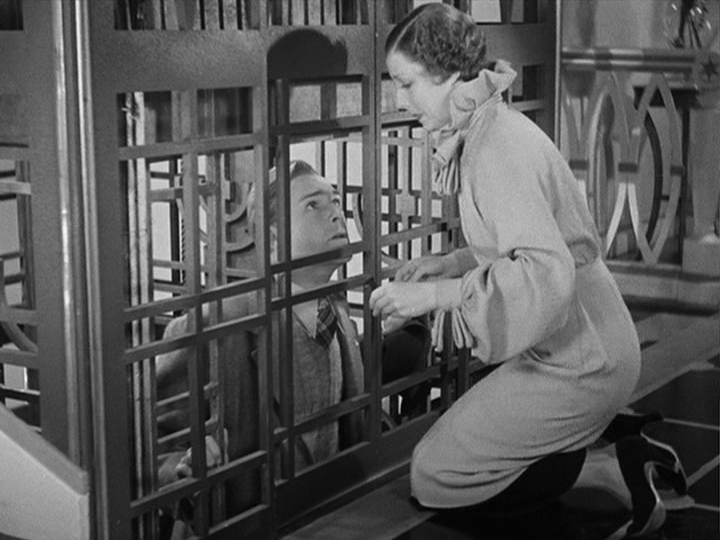 As you may guess from my profile picture, I am a big fan of that-guy-in-the-elevator aka Randolph Scott. I think his character in Roberta was very silly, just as in Follow The Fleet and he was really typecast as a dumb handsome in many of the movies in the 30's. But anyway I think he and Irene were very cute together! YAY! Looking forward for your reviews to both movies! 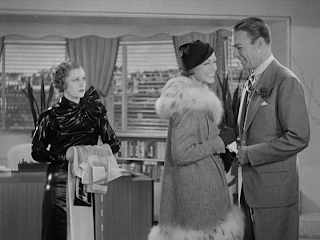 The pool scene in MFW is probably my favorite scene ever - Cary, Randy & Irene, the people I adore all in one scene! i am totally enjoying your posts, keep your wonderful work!